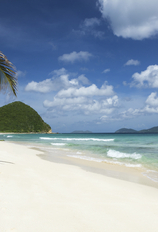 Get away from it all this summer without draining your savings to do so. These 10 secluded North American beaches are out of the way enough for solitude but close enough for affordable travel. Read on to find out where to swim in quiet coves, roll down empty sand dunes, and comb desolate sandy stretches for unbroken shells and sharks’ teeth. Halfway between the tip and the elbow of Cape Cod, Bound Brook Island (no longer an island) in Wellfleet is an ideal bike-ride destination for visitors hoping to ditch the Cape's summer crowds. 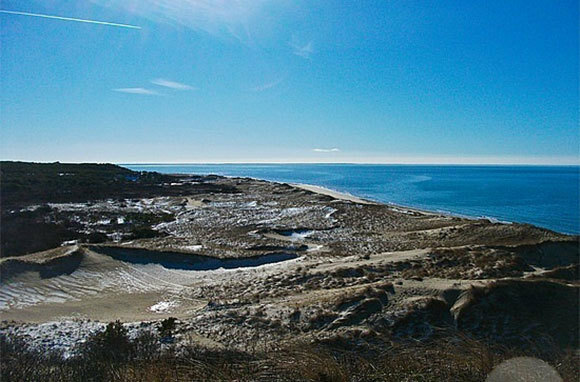 You'll dodge potholes and navigate unpaved roads en route to this out-of-the-way beach on the Cape Cod National Seashore, but the payoff is sweet: gentle water, towering sand dunes, a pine forest, and space all to yourself. What to Do: At low tide, you can walk across a massive stretch of sand to see aquatic life in the bay. For lunch, try a Route 6 clam shack or Mac's Seafood on the pier in Wellfleet for the town's namesake oysters. Don't miss the historic Atwood-Higgins House and other Cape Cod-style homes built by early English residents. Getting Here: Catch the bike shuttle or follow Route 6 to Coles Neck Road, which ends in a sand parking lot. The trail to the beach is less than a quarter of a mile from the lot. 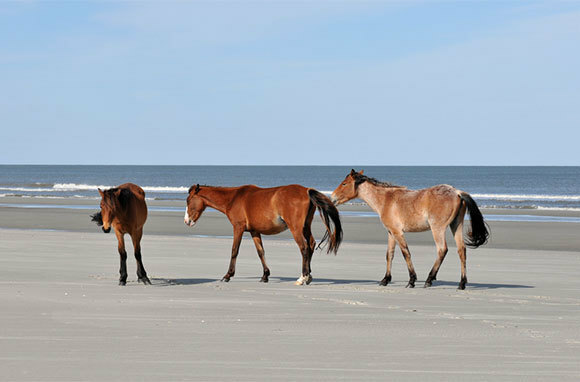 A popular getaway destination since the Carnegie family built mansions here in the late 1800s, the Cumberland Island National Seashore is no stranger to visitors. But thanks to an enforced limit of 300 visitors daily, the island and its undeveloped beaches still feel like exclusive escapes. Horses and turkeys run wild and sea turtles nest in the beach dunes. Scour the quiet stretch of sand from Dungeness Beach to the south end of the island in search of sharks' teeth, which are also often found in the roads and between the Dungeness and Sea Camp docks at low tide. What to Do: Check with the ferry dockhands about renting a bicycle for exploring the island. Park rangers will take you to the wildlife and historic districts on interesting walking tours. Getting Here: In summer, the Cumberland Queen passenger ferry to Cumberland Island runs two trips daily from downtown St. Marys (just off I-95) and a third afternoon trip Wednesdays through Saturdays. Reservations are recommended; trips take 45 minutes. Unlike its Myrtle Beach neighbor 17 miles to the north, Huntington Beach has no high-rises, no throngs of tourists, and no tacky souvenir shops. This is where the locals go to get away in summer. 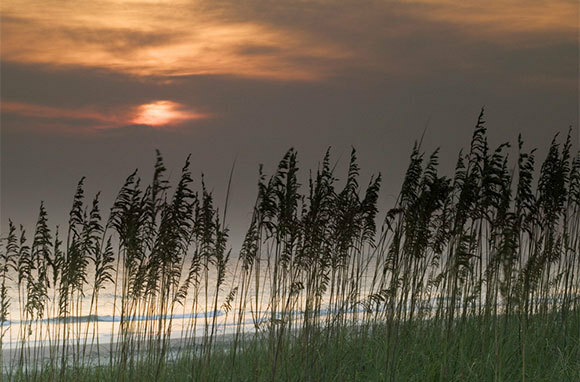 The sweeping Grand Strand beach, part of Huntington Beach State Park, is a serene spot known for excellent surf fishing and bird-watching. The salt marshes and freshwater lagoons here rank among the East Coast's top birding locations. What to Do: Watch for alligators in the lagoon and loggerhead sea turtles in the surf. Naturalists lead kayakers through the grass marshes and saltwater creeks. Nearby, you can tour Atalaya Castle, a historical Moorish-style home, and visit the adjacent Brookgreen Gardens. Camping is popular, with sites near the beach. Getting Here: From Murrells Inlet, take Highway 17 south for about three miles. The park entrance is on the left. In a past life, these two Lake Michigan islands, part of the Sleeping Bear Dunes National Lakeshore near Traverse City, were densely inhabited. Hike to endless miles of empty sugar-sand beaches and you'll see the mysterious ruins of cemeteries, barns, and farm equipment reclaimed by the wilderness. A beach walk on South Manitou takes you to two shipwrecks: one that ran aground in 1960 and another that sank in six feet of clear water in 1911. North Manitou is for serious backpackers seeking wilderness solitude. 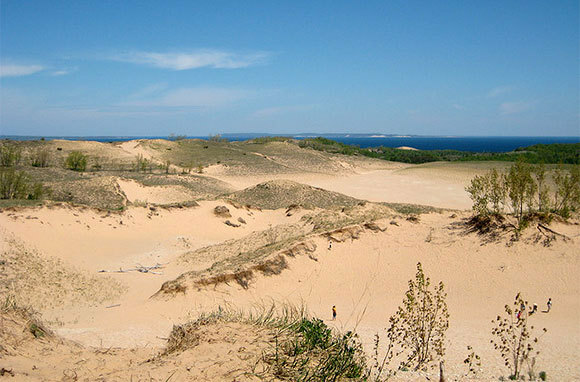 On the beaches of North and South Manitou, you can run, tumble, and roll down towering dunes to Lake Michigan. 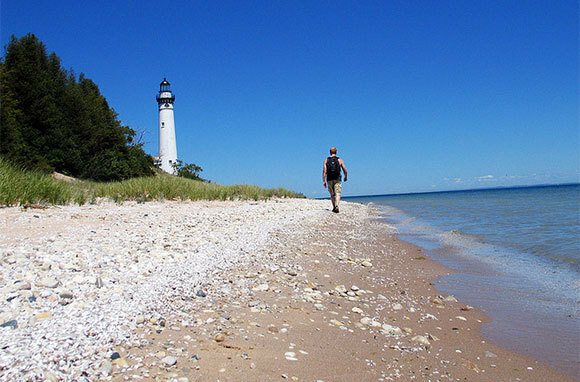 What to Do: On South Manitou, climb the lighthouse or explore the small village near the docks. Back on the mainland, check out the U.S. Coast Guard Station's Maritime Museum or walk through the restored early-1900s logging village. Getting Here: Follow Highway 72 west of Traverse City for 25 miles to Empire. Access the islands by private boat or passenger ferry. Unlike South Padre, the rowdy island synonymous with indulgent spring breakers, Padre Island's National Seashore and its secluded beaches are the more reserved, modest types. Big Shell Beach and Little Shell Beach, at the northern end of the 70-mile barrier island near Corpus Christi, are accessible only by four-wheel-drive vehicle. These beaches cover a section of shoreline where several Gulf currents meet and toss large deposits of unbroken shells onto the sand. In summer, Kemp's ridley sea turtles nest and dolphins play in the surf. 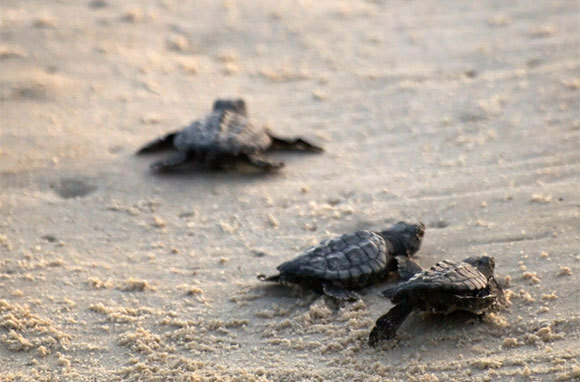 What to Do: Attend a sea-turtle hatchling release at sunrise in front of the Malaquite Beach Visitor Center to see the coin-sized babies take their first steps into the ocean. Other massive stretches of desolate beach are open to four-wheeling. Bird-watching, kayaking, windsurfing, and fishing are also popular here. 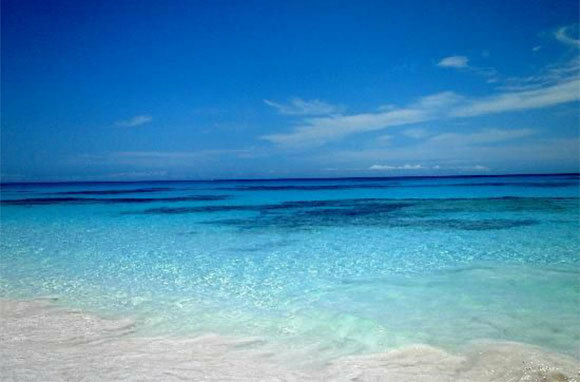 Getting Here: Enter the park at Malaquite Beach and head south with a four-wheel-drive vehicle. Only the most earnest of beach-seekers make their way along the Olympic National Park's 3.3-mile rainforest trail to Shi Shi, squishing through mud and gripping a rope on the final, steep descent to a beach whose only amenity is a pit toilet. But the resounding consensus is that it's worth it, especially in the drier summer months. If you share the wide-open Pacific views with anyone at all, it will be with other day hikers and campers who have set up tents and driftwood beach fires just above the high-tide line. Explore the unusual sea-stack rock formations and arches as you watch for otters, whales, seals, sea lions, and bald eagles. What to Do: Stop at nearby Neah Bay's Makah Museum to see 500-year-old artifacts from a native village. The fresh smoked-salmon pizza is a local favorite at Linda's Wood-Fired Kitchen in Neah Bay. 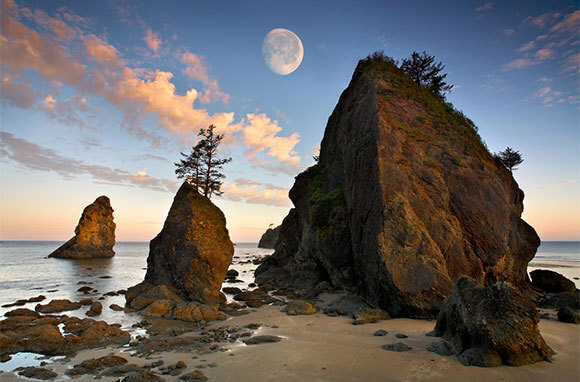 Getting Here: The trail to the beach begins at the south edge of the Makah Reservation off Highway 112 on the remote northwestern tip of Washington. Just outside Los Angeles on the Palos Verdes Peninsula, this rocky beach below a cliff in Abalone Cove Shoreline Park is a SoCal hidden gem. At low tide, the intimate Abalone Cove Beach is dotted with watery pockets teeming with temporary residents waiting around for the next high tide. Stoop to see colorful starfish, scurrying hermit crabs, and wildly patterned sea slugs. The views of Catalina Island are excellent year-round, but summer is the prime season to spot blue whales off the coast. What to Do: Naturalist-led tours based at the peninsula's Terranea Resort will help you identify tide-pool critters. Head toward the beach's sea caves when the tide comes in and you'll experience the blowhole effect. Also check out the nearby Point Vicente Lighthouse and natural-history museum. Getting Here: Access the park from Palos Verdes Drive South. A 20-minute hike down a steep hill from the parking lot will take you to the beach. 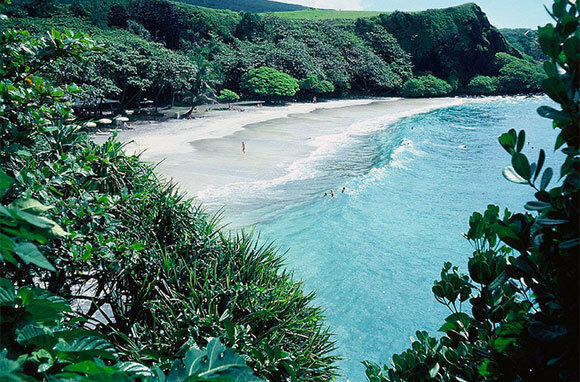 So taken by the beauty of this North Pacific beach on Maui, author James A. Michener reportedly called it the "most South Pacific" beach he'd ever come across. Hamoa, secluded in a perfect little crescent cove rimmed with shady hala trees and swaying palms, makes an apt finale at the end of a romantic drive on the notoriously curvy road to Hana. After cruising through lush tropical rainforests and frolicking in hidden waterfalls, you land here, on a patch of black-and-silver sand that's remote enough to keep most tourists away. Find a parking spot on a neighborhood street and walk down the steps to paradise. What to Do: Swimming and snorkeling are best in summer, when waters are calmer. You'll almost always see surfers, body surfers, and boogie boarders here. Nearby, hit the Spa at Travaasa Hana or wander through the Hana Cultural Center and Museum. Getting Here: Follow the renowned 68-mile Hana Highway; two miles south of the town of Hana, park on Haneo'o Road. If you don't know what it feels like to be the lone soul walking on a vast beach along the Pacific shore, then Chesterman is the ideal spot for your rite of passage. This 1.5-mile sandy beach in Tofino on Vancouver Island's wild and remote west coast is where the local surfers go when they're playing hooky or prepping for the international competitions that are held here annually. Fringed with B&Bs, West Coast-style homes, and a thick coastal rainforest, the often-desolate Chesterman Beach is great for beachcombing. 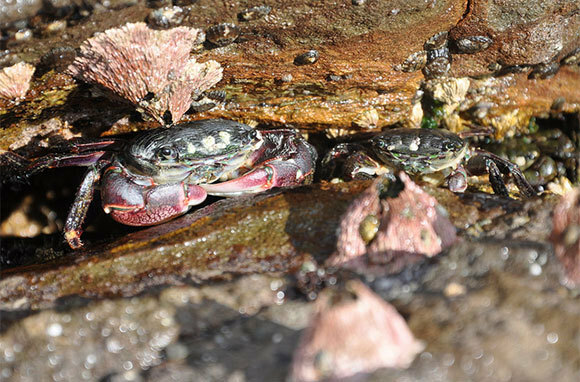 At low tide, you can walk to Frank Island and explore its tidal pools. What to Do: Stop by the Wickaninnish Inn's carving shed and watch talented artists at work. Learn to surf or paddleboard. 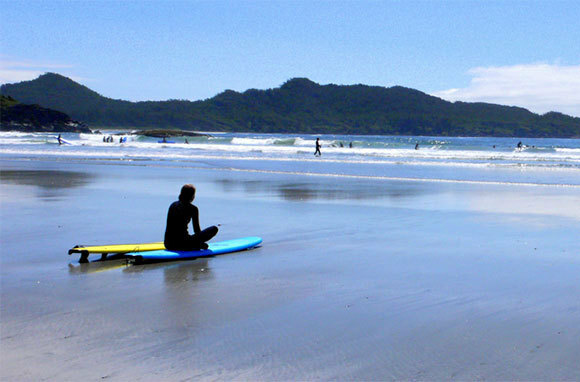 Hike the trails in Pacific Rim National Park or head into Tofino for a surf-town vibe. Getting Here: Catch a ferry or flight from Seattle or Vancouver to Victoria on Vancouver Island, then drive four and a half hours up the island and across a mountain range to reach Tofino. In the Out Islands of the Bahamas, finding a stretch of beach you can claim for yourself is the rule, not the exception. And Eleuthera's unspoiled, exotic Lighthouse Beach is one secret pink-sand hideaway that hasn't yet been overrun. Take it easy and recalibrate to island time as you bump along the one-lane unpaved road in your rented SUV to get here. On the skinny island's southern tip and far from any airport, this beach is nothing more than a gorgeous swath of powdery blush sand with an old lighthouse perched atop a limestone headland. What to Do: Walk between two little cays and you'll discover a private beach with clear turquoise water. Hike the steep trail to the lighthouse, spend the day snorkeling, or bring a picnic and watch the sunset. 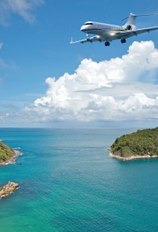 Getting Here: Bahamasair and Pineapple Air fly into northern Eleuthera.